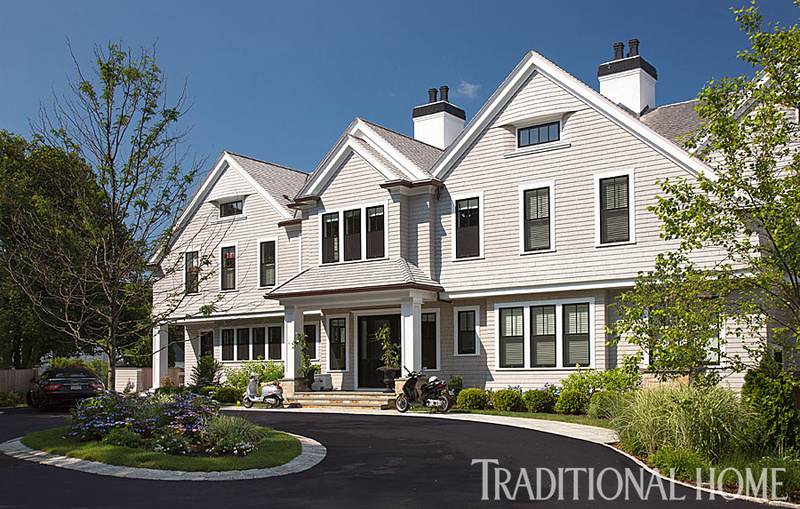 Scott and Lisa Hilinski envisioned a beautiful, luxurious second home that would serve as a refuge from city life in Boston. Reality required them to temper that vision with practicality. Their hectic family life—four children ranging in age from 7 to 13, plus a host of extended family and friends who would assume the roles of “frequent visitors”—called for materials that would hold up to beach life and active play. 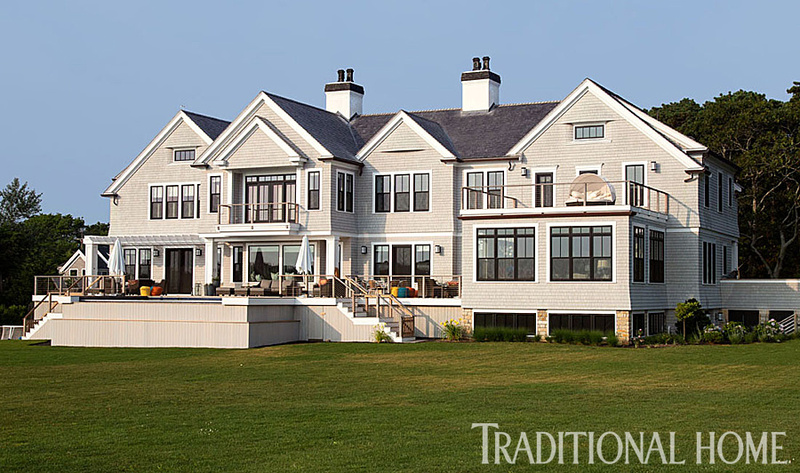 Enter Boston’s Daniel Reynolds, who created both the architectural and interior design of the home with a breathtaking plan that fulfills the couple’s desire to pair refined taste with a flair for making their family and guests feel at ease. Reynolds helped the Hilinskis achieve a level of supreme, stylish comfort with a design charged with aesthetic interest but so carefully edited that it permeates the home’s rooms without overwhelming them. A curved driveway gracefully welcomes guests. Architectural and interior design: Daniel Reynolds, Daniel H. Reynolds Design Collaborative, LLC, 46 Waltham St., Suite 202A, Boston MA 02118 ; 617/680-3516, danielhreynolds.com. 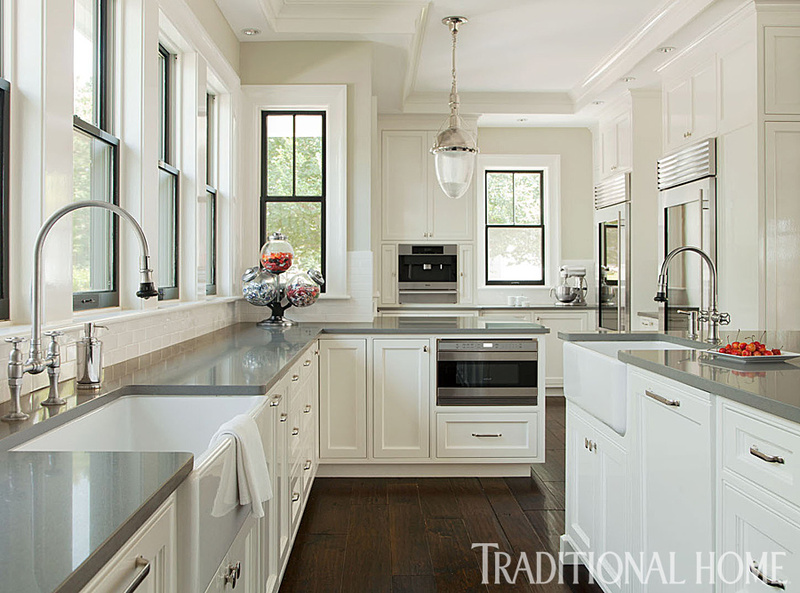 Trim and cabinetry paint, shutter paint (“Atrium White,” high gloss); ceilings (white, flat); wall paint on main level (custom, 50 percent “Moonshine” #OC-56), matte): Benjamin Moore, benjaminmoore.com. All wood blinds (2-inch Country Wood Classic/White #820); all woven blinds except master bedroom (“Biscayne”/Hammersely, Provence Woven Collection): Hunter Dougas, hunterdouglas.com. The foyer combines the designer’s artful framing of outdoor scenery with Scott and Lisa’s appreciation for high style. The welcome begins with the foyer’s two iconic Barcelona chairs by modern architecture pioneer Ludwig Mies van der Rohe in white leather. They’re teamed with a center table that displays shapely legs, reinforcing a light and open feeling. Table (“Pugin Dining Table” #1108, Charles Pollock Signature): William Switzer, williamswitzer.com. Chairs (“Barcelona Chair,” by Mies van der Rohe ): Knoll, knoll.com. Chair leather (“Velluto Pelle”/Boomerang #0440): Spinneybeck, spinneybeck.com. Chandelier and wall sconce (custom design by Daniel H. Reynolds): fabricated by O’Lampia Studio Inc., olampia.com. Wallpaper (“Amalfi Silk”/Tirreno Blue #4354): Phillip Jeffries, phillipjeffries.com. Drapery (“Hampton Embroidery”/Slate, Blue #FD632, by Mulberry Home, colorway discontinued): Lee Jofa, leejofa.com. Marble pedestals (antique): owner’s collection. Glass globes on pedestals: Crate & Barrel, crateandbarrel.com. Barnacle vase centerpiece (#SWN242): FDO Group, fdogroup.com. Bench fabric (“Wilderness”/Indigo #ED85140.680, by Threads): Lee Jofa, leejofa.com. Color makes its appearance in a quiet manner, in soft blues and corals that are directed by the Hilinskis’ art choices. Reynolds, who bears strong opinions about forcing color into a scheme, deliberately minimized focal points so that there were no competing design elements. Blue silk from Philllip Jeffries covers the entry wall where a console table by Rose Tarlow/Melrose House displays art. Table (“Tuscany Console Table” #217, custom finish): Rose Tarlow-Melrose House, rosetarlow.com. Table lamp (“Santa Fe Table Lamp” #4202, Charles Pollock Collection): William Switzer Ltd., williamswitzer.com. Lamp shade (“Crinkle Paper Shade”) Formations, formationsusa.com. Art over console: owner’s collection. Sculpture (Praying Monk): Mohr & McPherson, mohr-mcpherson.com. 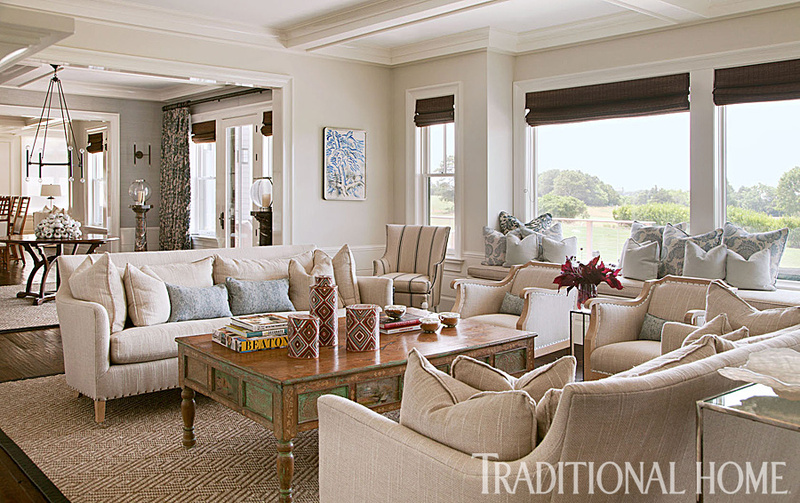 The couple, heralded by Reynolds for their impeccable taste, didn’t rely on the blue-and-white palette that so often blankets coastal retreats. Instead, they wanted to reflect their own personalities, showcase their collections, and relax their guests. Area rug (Sisal, “Brescia”/Bone); binding (black leather) Landry & Arcari, landryandarcari.com. Sofa (“Victor”); chairs (“‘Jacques”): Verellen, verellen.biz. Sofa, chair, and window-seat cushion fabric (“Rustique”/Parchment #ED85039-230, by Threads): Lee Jofa, leejofa.com. Chair trim (“9/16-inch Cambridge Strie Braid” #977-34160): Samuel & Sons, samuelandsons.com. Blue-patterned pillows on window seat (“China Blue”/Linen, China Blue #DPEMCH303, by Sanderson): Zoffany, zoffany.com. Smaller light blue pillows (“Moody,” colorway discontinued): Nobilis, nobilis.fr. High-back chairs (“Cantrell Chair” #1506-24, by Suzanne Kasler): Hickory Chair, hickorychair.com. Striped chair fabric (“Wilderness”/Indigo #ED85140-680, by Threads): Lee Jofa, leejofa.com. Coffee table (antique Portuguese reverse painted glass and carved panel table): Mohr & McPherson, mohr-mcpherson.com. Canisters on coffee table (“Cloisonné Jars,” by Fabienne Jouvin): through FDO Group, fdogroup.com. Blue pillows on sofa (“Sun Bleached Paisley”/Cloud #HH1): De Le Cuona, 212/702-0800, www.delecuona.co.uk. Drink table between chairs at window; console table: Grand Rapids Furniture Co., grandrapidsfurniture.net. Art by striped chair: owner’s collection. Table in foyer (“Pugin Dining Table” #1108, Charles Pollock Signature): William Switzer, williamswitzer.com. Wallpaper in foyer (“Amalfi Silk”/Tirreno Blue #4354): Phillip Jeffries, phillipjeffries.com. In the first-floor public spaces Reynolds covered the main elements of all upholstered furniture with the same two textural linen fabrics, establishing continuity throughout the open floor plan. The degree of formality—or the lack of it—in each space is dictated by furniture silhouettes, seating arrangements, and subtle architectural differences. “Everything is visible from one space to another, and the outdoors extends the spectacular views, so it was important that nothing stand out and obstruct that,” Reynolds explains. Photo by striped chair (by Alison Shaw): Focus Gallery, thefocusgalleries.com. Sofa end tables (antique, hand-painted Chinese trunk on custom metal base): Mohr & McPherson, mohr-mcpherson.com. Spaces for eating veer toward the casual but with plenty of noteworthy sculpture to contribute to the easy vibe. Bar tables (custom, “Propeller Side Table”): Rose Tarlow-Melrose House, rosetarlow.com. Banqette (custom design): Daniel H. Reynolds Design Collaborative, danielhreynolds.com. 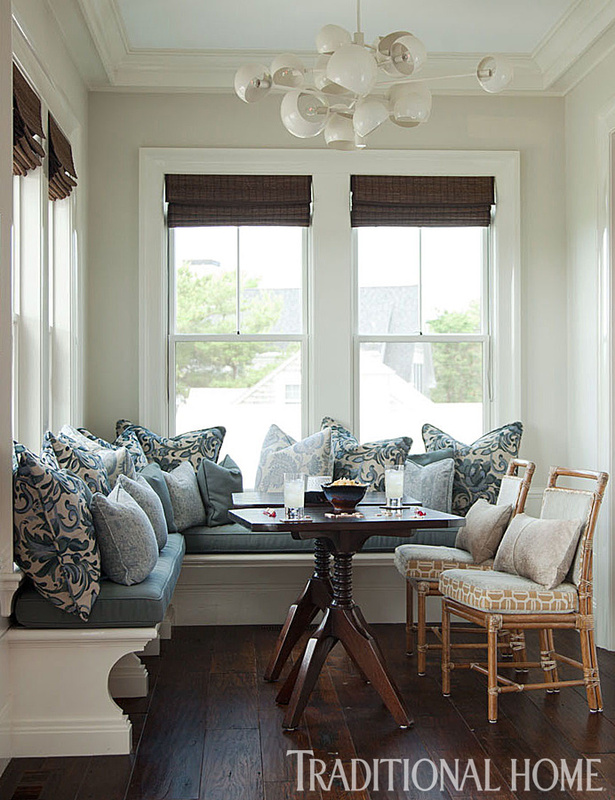 Bench pillows on window seat (“China Blue”/Linen, China Blue #DPEMCH303, by Sanderson): Zoffany, zoffany.com. Bench pillows (“Hampton Embroidery”/Slate, Blue by Mulberry Home, colorway discontinued): Lee Jofa, leejofa.com. Ceiling pendant (“Kopra Burst #434, by David Weeks): through Ralph Pucci Int’l, ralphpucci.net. Sofa (“Duke”); chairs (“James”): Verellen, verellen.biz, through Hudson, hudsonboston.com. Sofa fabric (“Lorena”/Parchment #ED85083.230, by Threads); chair fabric (“Rustique”/Parchment #ED85039.230, by Threads): Lee Jofa, leejofa.com. Coral-patterned pillows (#30780.712): Kravet, kravet.com. Coffee table (vintage woven fabric with steel frame): ABC Carpet & Home, abchome.com. Wood trays: Crate & Barrel, crateandbarrel.com. End tables (Bayan wood tree base/Natural): Andrianna Shamaris, andriannashamarisinc.com. Glass cylinder lamp; basket: Hudson, hudsonboston.com. Wall sconce (“Nobi Wall Lamp,” by Fontana Arte): Chimera Home, chimeralightingdesign.com. Benches (“Allegra” #F-OT08 with seat cushion #F-OT08C): Formations, formationsusa.com. Bench-cushion fabric (“Ben 10197/990,” vinyl): Zimmer + Rohde, zimmer-rohde.com. Landscape paintings behind sofa (Presence, Marshal, and Fort Hill, by Rick Fleury, oil on copper): Addison Art Gallery, addisonart.com. Tall ladder-back chairs pull up to a corner table, offering a special spot to play cards and board games. Table (“Provincetown Pedestal Table,” custom finish, by Richard Mulligan): Mulligan’s, mulligansusa.com, through Webster & Co., webstercompany.com. Chairs (“Gigi Oli,” discontinued): Hudson, hudsonboston.com. Pendant light (“Kopra Burst #434, by David Weeks): David Weeks Studio, davidweeksstudio.com. 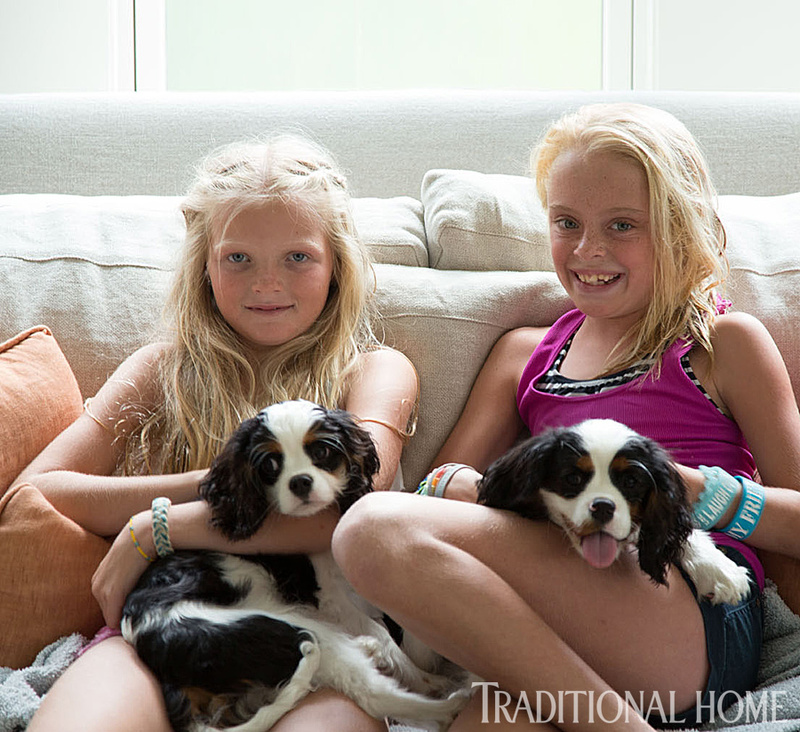 Callie Hilinski, left, with her friend Emily and King Charles Cavaliers Lucky and Charlie. 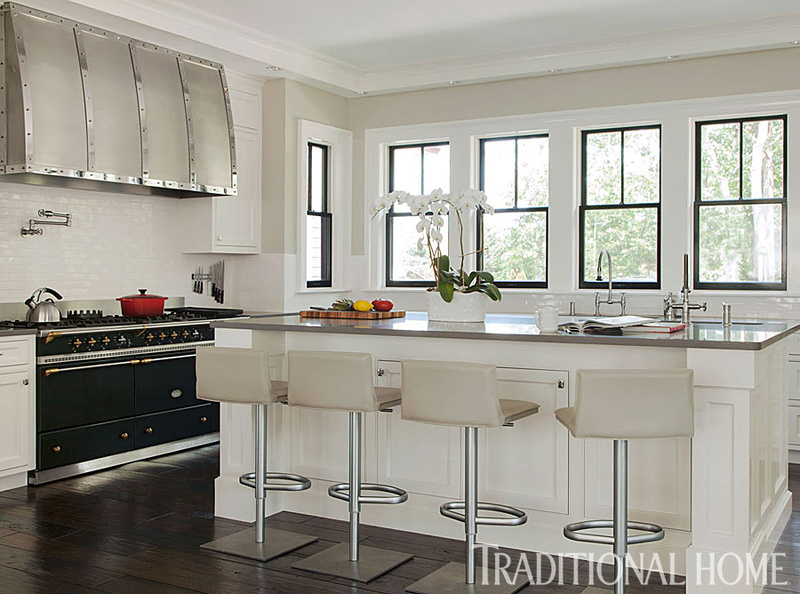 The all-white kitchen captures attention with contemporary, adjustable leather bar stools from Design Within Reach. The pendant light is from Circa Lighting, and countertops are from Caesarstone. Barstools (“Bottega”); fabric (“Ice Gray Leather,” colorway discontinued): Design Within Reach, dwr.com. Range hood (custom, stainless steel with polished nickel): Carbone, cmfi.com. Polished nickel pulls from RH contrast with bright white cabinetry. Cabinetry (custom design by Daniel H. Reynolds): fabricated by Horgan Millwork, horganmillwork.com. Cabinetry finish (“Atrium White,” high gloss); paint on window sashes (black, gloss): Benjamin Moore, benjaminmoore.com. Cabinetry hardware (Ephram Collection/Polished Nickel): Restoration Hardware, rh.com. Countertop (“Pebble” #4030): Caesarstone, caesarstoneus.com. Backsplash tile (2x6-inch Old World Crackle): Tile Showcase, tileshowcase.com. Pendant light (“Garey,” by Thomas O’Brien, custom): Circa Lighting, circalighting.com. Microwave (by Wolf); refrigerator (by Sub-Zero): Sub-Zero/Wolf, subzero-wolf.com. Perimeter faucet (Steam Valve Series, bridge faucet with pull-off spray); island faucet (Steam Valve Series, mono block with pull-off spray); pot-filler faucet (SteamValve Series, wall-mounted): Jaclo, jaclo.com. The dining room sets formality aside. The graphic presence of the kitchen barstools segues to the dining room, where vinyl-covered chairs have exaggerated, modern ladder backs. 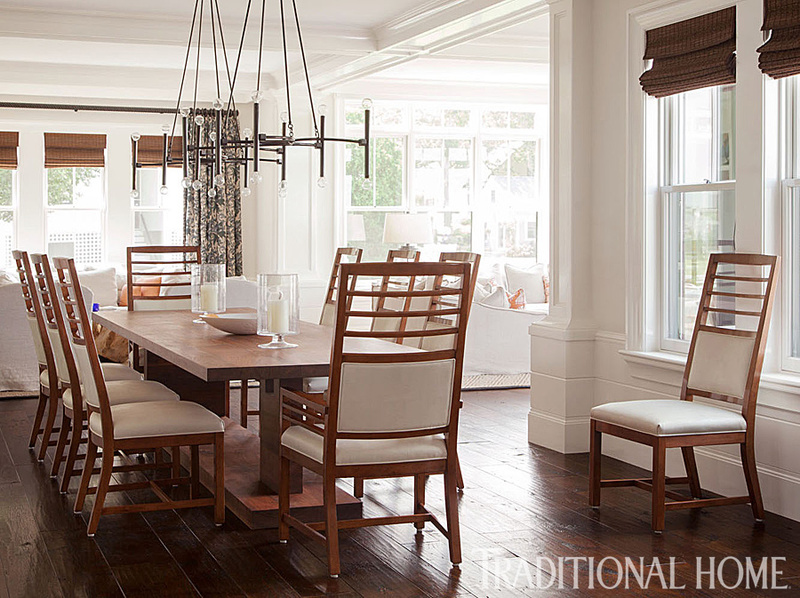 Light fixtures designed by Reynolds are both airy and striking. Chandelier (custom design by Daniel H. Reynolds): fabricated by O’Lampia Studio Inc., olampia.com. Table (custom, “Plank Table”/Walnut, by Robert Bristow): through Ralph Pucci International, ralphpucci.net. Chairs (Spring Lake Collection, discontinued): Henredon, henredon.com. Chair fabric (“Ben 10197/990,” vinyl): Zimmer + Rohde, zimmer-rohde.com. Hurricanes: Crate & Barrel, crateandbarrel.com. 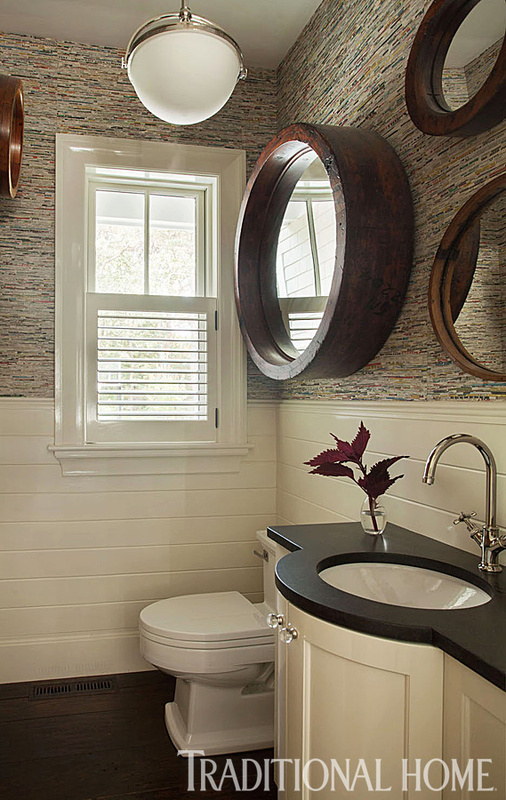 The powder room walls are decorated with mirrors made from reclaimed wood factory pulleys. Wallpaper (“News Worthy,” by Weitzner): through Donghia, donghia.com. Mirrors (reclaimed wood factory pullies): through Twelve Chairs, twelvechairsboston.com. Hanging light (“Stratford Pendant”/Polished Nickel): Hudson Valley Lighting, hudsonvalleylighting.com. Vanity cabinet (custom design by Daniel H. Reynolds); fabrication by Horgan Millwork, horganmillwork.com. Countertop: honed Absolute black granite. Vanity hardware: (Vintage Knob Collection): Restoration Hardware, rh.com. Faucets (Montreux Collection): Axor by Hansgrohe, hansgrohe-usa.com. 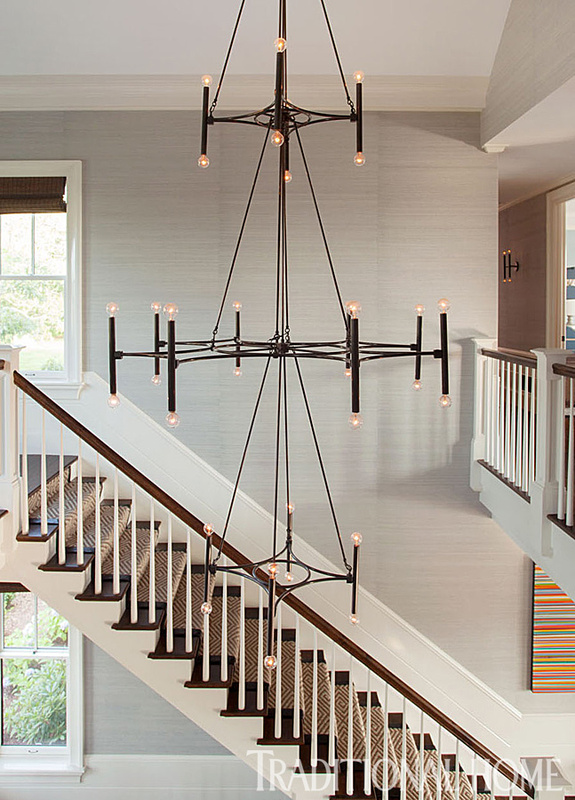 An iron chandelier by architectural designer Daniel Reynolds dangles with modern flair near the stairs. Chandelier and sconces (custom design by Daniel H. Reynolds): fabrication by O’Lampia Studio Inc., olampia.com. Carpet on stairs (sisal, “Brescia”/Bone); binding (black leather) Landry & Arcari, landryandarcari.com. 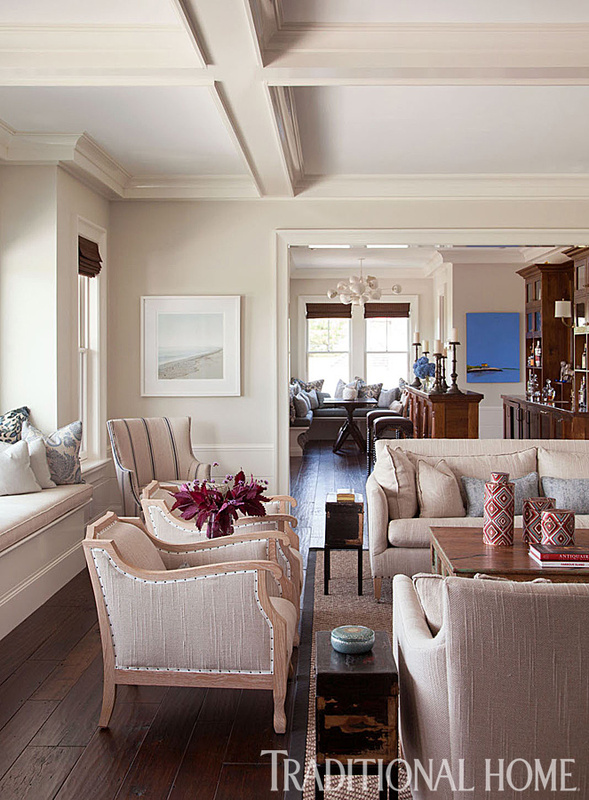 At the top of the staircase, black-and-white family photos flank a bank of windows above a long, cushioned window seat topped with pillows made of fabrics from Lee Jofa and Nobilis. Window-seat cushion (“Rustique”/Parchment #ED 85039.230, by Threads); floral pillows (“California”/Multi #R1380.2, by BP&J Baker): Lee Jofa, leejofa.com. Striped pillow (“Rayure Gatsby” #8910/93); blue pillow (“Moody” #48145): Nobilis, nobilis.fr. In the bedrooms, Reynolds departed from the cohesive design of the public spaces. The master suite glows with tranquility in a creamy monotone palette. 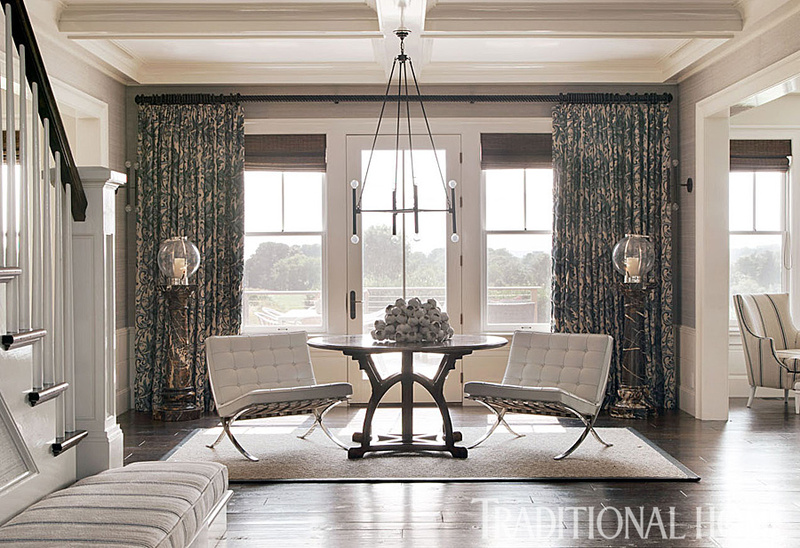 Elegant alpaca-and-silk drapery panels offer a cocoon-like effect as they cascade over the windows. 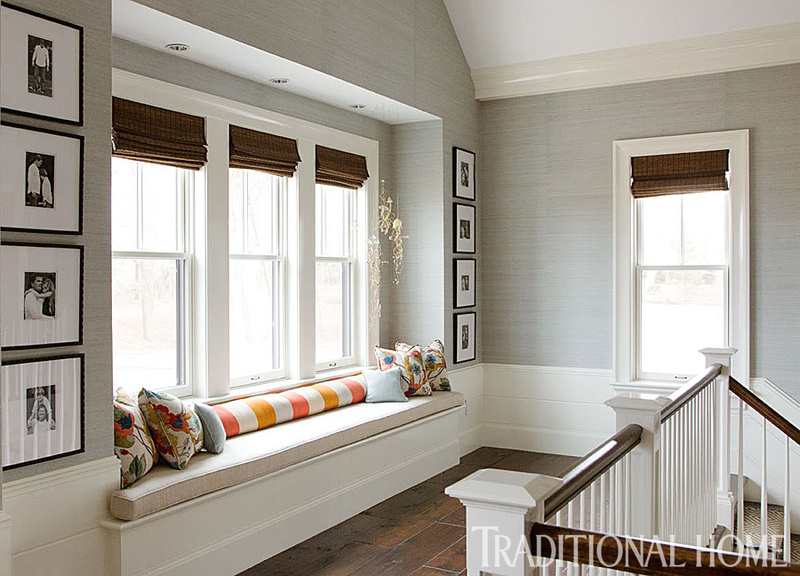 A window seat features a botanical print fabric by Mulberry Home for Lee Jofa. Drapery (“Normand”/Ivory, discontinued): De Le Cuona, delecuona.co.uk. Drapery hardware (Blacksmith Collection with Zug finial #251070): Vesta, http://ivesta.com/http://ivesta.com/. Blinds (Provenance Woven Woods, in Patagonia Spruce): Hunter Douglas, hunterdouglas.com. Sheers (“French Vanilla Sheer” #AS1010, Prima Alpaca Sheers): Sandra Jordan Collection, sandrajordan.com. Carpet (custom, “Woven Trends”/White): Landry & Arcari, landryandarcari.com. Bed (custom, “Oppede Bed”/Walnut and Iron #614): Rose Tarlow-Melrose House, rosetarlow.com. Bed linens (Giotto Collection): Sferra, sferra.com. Bedside table, mirror at left of bed (designed by Daniel H. Reynolds): fabricated by Art Applications Inc., artapplicationsinc.com. Table lamp (“Meri”): Oly, olystudio.com. Window-seat cushion, floral pillow (“Grandiflora”/Silver #FD630.J125, by Mulberry Home): Lee Jofa, leejofa.com. Cream pillow (“Baroque”/Bone #BAQ2); small pillow (“Baroque”/Anthracite #BAQ5): De Le Cuona, delecuona.co.uk. Wall light (“Swing Arm Lamp” #A-1136, by Leonardo Marelli for Estiluz): Y Lighting, ylighting.com. The adjoining bathroom is highlighted with what Reynolds refers to as a “floating sculpture,” a freestanding soaking tub handsomely encased in walnut. Bathtub (“Origami” #6632): BainUltra, bainultra.com. Tub surround (custom design by Daniel H. Reynolds) fabrication by Horgan Millwork, horganmillwork.com. Bath fixtures (Montreux Collection): Axor by Hansgrohe, hansgrohe-usa.com. Shades (“Normand”/Ivory, discontinued): De Le Cuona, delecuona.co.uk. Photo (by Alison Shaw): Focus Gallery, thefocusgalleries.com. 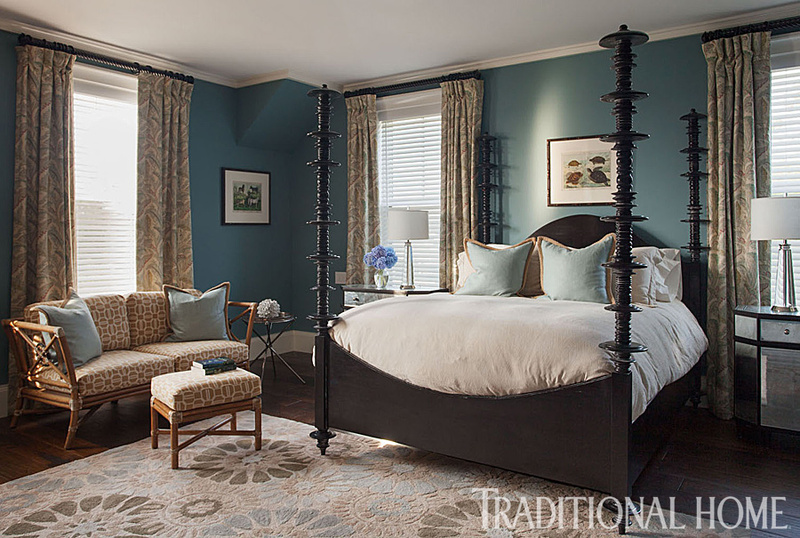 A sultry blue covers the walls in the guest bedroom, and the four-poster bed from Noir invites sweet dreams. Wall paint (“Jamestown Blue” #HC-148): Benjamin Moore, benjaminmoore.com. Drapery (“Nevis”/Seaglass #LA1295.324, by Laura Ashley): Kravet, kravet.com. Drapery hardware (2-inch braided wood rod with finial #FW230 in high gloss black): Window Imagination, windowimagination.com. Area rug (wool/steel blue floral): HomeGoods, homegoods.com. Settee (“Water Mill Settee” #WK-13); ottoman (“Water Mill Ottoman” #WK-11): McGuire, mcguirefurniture.com. Settee-and-ottoman fabric (“Emerald Cut”/Biscuit & Ivory #2643903): Schumacher, fschumacher.com. Linen pillows on settee and bed: Pottery Barn, potterybarn.com. Table at right of settee (antique): owner’s collection. Art above table and bed (vintage botanical prints) Hudson, hudsonboston.com. Bed (“Ferret Bed”/Hand-Rubbed Black): Noir, noirfurniturela.com, through Hudson, hudsonboston.com. Bed linens (Katsura Collection in Wheat): Calvin Klein, calvinklein.com. Bedside tables (“Donnabella Chest”): Mitchell Gold + Bob Williams, mgbwhome.com. Table lamps (discontinued): Restoration Hardware, rh.com. The pool deck is always alive with the sounds of the Hilinski kids and their friends. It’s also a place where their mother, Lisa, can watch their dad, an avid golfer, play on the course next to the site where their home was constructed in 2011. While the Hilinskis are basking in the honeymoon phase of life in their new abode, the long-term outlook is just as sunny and bright. Rattan furniture (La Jolla Collection, in Chestnut); planters (Weather Cast Stone Collection); cushions on rattan furniture (“Textured Linen”/Charcoal, by Perennials): Restoration Hardware, rh.com. Orange-patterned pillows (Outdoor Pillow Collection): Pottery Barn, potterybarn.com. Dining table (Narrows Collection); chairs (discontinued): Janus et Cie, janusetcie.com.